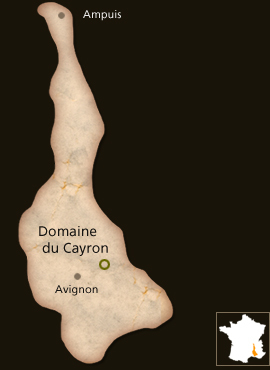 Domaine du Cayron is located between Avignon and Vaison la Romaine, at the foot of Dentelles de Montmirail. The estate was founded in 1840 and the cellar in 1936 by our Grandfather. It has been managed by the Faraud family for four generations. The fifth generation is represented by the three sisters Faraud, Delphine, the eldest looks after the administration and trade; Cedrine and Roseline contribute with their knowledge and know-how in order to produce high quality wines respectful of long standing traditions under the always attentive eyes of their father, Michel Faraud. The vineyards are about 16 hectares on clay and limestone soils with a southwest exposure. 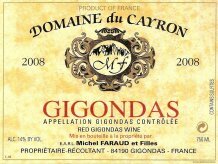 Vineyards locations in Gigondas include Dentelles de Montmirail, Col du Cayron and Bois de Menge. Vines are between 20 t0 50 years old. Garpes varieties include Grenach Noir (70%), Cinsault (15%), Syrah (14%) and Mourvèdre (1%). Yields are far below the allowed in Gigondas of 35 hl/ha. Harvest is all hand picked. Deep red color with dark tints. Exotic nose of raspberry, mulberry, and apricot. Very fresh and spicy in the mouth with blackberry flavors. Pair with Beef Burgundy, red meat, game and cheeses.